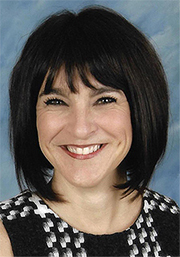 Suzanne Caverly, assistant principal at Poly Academy of Achievers and Leaders, earned the Gene Lentzner Human Relations Award this month from the California Conference for Equality and Justice. The award is given in the name of Gene Lentzner because of his life-long commitment to bringing diverse people together to improve human relations in the Long Beach area. Caverly has volunteered with CCEJ since 2011. She has served as a Building Bridges Camp volunteer, camp director, and camp advisory board member. She is active in the movement for Restorative Justice in education. Restorative Justice emphasizes a positive behavior support approach. Caverly has helped to change discipline practices and student support systems on many campuses throughout the Long Beach Unified School District. She accepted the award at CCEJ’s annual awards dinner. “This award is really an example of the work we’re doing in Long Beach Unified, with our focus on social-emotional support and school climate, and one of the exciting points of the night was having the opportunity to say that,” Caverly said. She also has served as a Cub Scout leader for eight years and as a leader in a church-based life recovery program for almost 10 years.